Disinformation is rampant everywhere. My information comes from my Montauk Project indoctrinations, experiences, conversations with scientists involved in Illuminati programs, communications with alien and interdimensional beings whom I met at various government projects, and through the probing of my own Oversoul. I cannot offer you physical proof at this time. I can only tell you that it is available in certain places. Although all existence is simultaneous, and time and space are merely illusions of physical reality, for the purpose of this book I will present the majority of history from a linear perspective. There are also infinite universes, both physical and non-physical, but for now, I will only tell you about this one. In the subsequent years following the publication of my last book, much has been written about by other researchers concerning Reptilians and their rituals. This theme has found its way into the psyche of the public. Most people are still not willing to accept or even entertain the idea that hybrid Reptilians are in control of this planet and perform blood rituals and ceremonies using humans as the source of food and hormones. I wish it were not true. But I cannot change history, current events, or what I know to be true. The controllers plan the pattern of coming events in such a way to purposefully disorient the masses while they alone see the destination and the order of life. The masses are lead to believe that haphazard events amidst chaos shape their existence. In true reality, there is no such thing as chaos. Chaos is simply a pattern not yet understood or perceived. Think about an ant crawling over a designed, tiled floor. The ant may seem confused or disoriented; not knowing which way to go. But a human being watching the ant from a higher perspective clearly sees the floor pattern and knows which way the ant can get to its destination. To the ant, there is only perceived chaos. To the human, there is a prescribed pattern. To the controllers, the humans are the ants. The controllers are interested in directing the people in such a way that they do not know that they are being directed. The controllers work slowly and methodically from a global perspective to accomplish their goals. With awareness, you too, can perceive order from the chaos, make some conscious decisions, and gain control of your own life and destiny. Communication with me was entirely telepathic (the Draco reptilian). Mentally, it told me that it came from the far future where humans no longer existed, and that its species was not from this reality. Continuing, it said that its species had traveled back into the distant past to create a race of beings, which I knew as the Reptilians, to antagonize and test humans. It also told me that they were assisted by the Sirians of Sirius A in the creation of the Reptilians and their placement in the Draco star system. This is their hierarchy, and is based on the nine level Angelic Hierarchy that I discussed in The Healers Handbook - A Journey Into Hyperspace (Sky Books, 1999). As an aside, the Hindu caste system is a direct replica of the Reptilian hierarchy. The politics of the interventionist Draco trading colonies (see Dune - whose Arrakeis - the home star of Dracos and Dune - is correctly located in Alpha Draconis) - definitely became represented by Enlil/Yahweh/Michael side of the An - Anunnaki family. Also should be seen as the roots of insurance and banking on Earth. The templar followers of the MAG (draco matriliny) line are often credited with ’inventing’ insurance and banking for the west. This is absurd - since they had already installed such industry - so close to fear and extortion - to HARVEST COLONIES on hundreds of planets. The "skull and bones" - Orion- origins of the Piracy and Extortion story is an example of insurance and banking that loses its public relations budget. More on the skull of the Mag below. Later - as Enlil/Yahweh under the name of "God" Michabo (Michael) installs genetic rules in Aboriginal Australia and the America’s he is following the Drac tradition entirely focused on preventing change - and facilitating harvest of colonies- like forests whose only purpose is to be cut down. At a deeper level we should investigate the connection between loss of DNA implosion - the physics of loss of soul & access to BLISS - called NEPHILIM which befell these Draco (lost Seraphim) families. Loss of fire in the blood created loss of lucid dreaming, loss of "ensoulment" and LOSS OF LONG TERM MEMORY. Part of their problem was loss of ability to navigate in time travel (’`Guild Navigator’ in Dune - star navigating time travelers, able to warp space from within) - due to this loss of DNA coherence. Not unlike one of their resultant cultures - TIBETAN - who are intensely aware that their is no steering their collective cultural direction (time travel) without a leader who IS able to remember past lives. This is exactly what Draco lost. It is profound to compare this to Zulu shaman leader last week bemoaning to us how his grand children lost the ability to lucid dream just after they suffered being immunized. This is an example of how borg - fallen Drac empires - treat DNA. By not loving their genes enough to set them free - they blind their children. 3 - Is This Planet Taken? In the below - we suggest comparison to Lysa Royall’s "Prism of Lyra" book - a ’channeled’ more romantic and intuitive account- which at least agrees surprisingly about the Lyraen origin of today's humans. Because the Lyraens did not have a defense system in place, they were a sitting target for the Reptilians, also referred to as the "Draco". After being brutally attacked by the Draco Empire, the survivors of the Lyraen society dispersed to other locations throughout the galaxy. The remnants of the Draco attack on Lyrae are still seen by today’s scientists. In 1985, a newspaper article stated that scientists are able to observe remnant waves of a blast that fan outward, and emanate from a central part of this galaxy. They believe this blast to be several million years old and of such intense proportions that the wave is still traveling toward the edge of the galaxy before dissipating. They claim not to have any idea of what created the blast. So, the Sirians created a defense mechanism located in the Mars underground. This geometry is also replicated and contained within the Giza Plateau in Egypt. Compare this to Richard Hoagland - still clue less to WHY dolmen like Giza and Cydonia are at tetrahedral latitudes. By modulating (adjusting) the spin rate of planets at tetrahedral hand holds - planetary spin comes into phase with zodiac spin - this self similar spin relation (implosive collapse) is critical to stabilizing gravity and therefore atmosphere. It is said those (Ophanim? Seraphim? winged Dracs? Ciakar? Cherubim?) who placed the Draco in our galactic sector knew that the humanoid remnant would need an aggressive parasite to trigger development. Further the result of the part of the humanoid blood on Earth today receiving a blood line cross from Draco (URu cross with Ibi) - is beneficial. (see Lawrence Gardner defending his Drac family root). This is related to usually AN or Celtic or British RH negative blood. The reptilian Drac blood Enki (RA - abRAham) crossed with the cro-magnon monkey blood had DNA was LESS vital than the indigenous (RHesus) monkey blood. So the reptilians had to keep in-breeding (as in Holy Blood Holy Grail) - consistent with what Swerdlow says below. Areas (UK) where this RHESUS Monkey blood is absent (RH negative) may lead the world in lack of compassion. E-liz-a beth (from Lizard born) breeds a line where no permission to cry produces a stiff upper lip. The remnant Lyraens who colonized other planets formed an alliance against the constant Reptilian attacks. They called this alliance the Galactic Federation, comprised of 110 different colonies. The colonies belonging to the Federation wished to maintain their new identities, and no longer associate with the old way. Together, the Federation colonists managed to repel the Reptilian attacks. The Reptilians who were inside the hollow comet, now Venus, came to the surface of this new world. They built seven domed cities, one for each of the seven groups in the hierarchy. 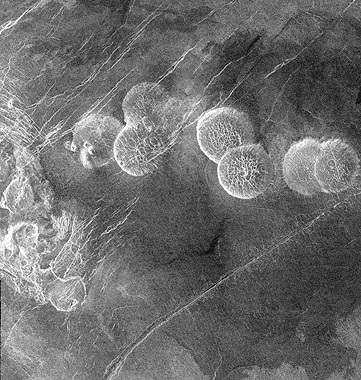 In the mid-1980s one of New York's daily papers, Newsday, reported that a Soviet space probe penetrated the cloud layer of Venus and photographed seven white domes the size of small cities, all in a row. After a page-long diatribe, the American scientists concluded that this was all a natural formation. Additionally, the Martians also attacked the Reptilians from space since they, too, were searching for a Reptilian-free environment in which to live. This might be considered the real First World War on this planet. 1. The Sirians were at war with the Orion system. This hostility exists to this day. It is intriguing since the beings in Orion were once very human, as Lyraen colonists, and then were taken over by the Reptilians. However, the Sirians and the Reptilians trade with each other and the beings from Sirius A sell weaponry to the Dracos! A complex political situation indeed. 2. The comet also caused the planet Uranus to flip on its side. It is the only known planet that rotates north-South instead of East-West. The loss of the Martian atmosphere caused by Draco’s playing billiards became the "Total Recall" legend (movie about Martian history and the oxygen war). The Draco bases there today still have no hesitation to shoot down a NASA probe, although increasingly as the US government becomes a satellite of the shape-shifters- they begin to let a few Earth probes in. To stop the fighting and make the Earth peaceful enough for colonization, a meeting was held by a council from the Andromeda Galaxy, on a planet called Hatona. This meeting took place outside of the Milky Way Galaxy with a neutral council because all civilizations within the Milky Way Galaxy were in some way connected to the fighting, and all had some sort of stake in belonging to the winning side. Interesting prequel to letters from andromeda from Alex Collier (author of "Defending Sacred Ground"). The Hatona Council convened for many decades as the fighting continued in this solar system. Finally, with their intercession, an agreement was reached between some of the human factions and the Reptilian Earth colonists. Keep in mind that this agreement was without the participation of the Reptilians from the original Draco Empire. The agreement stated that a new breed of humanity would be created on Earth that would contain the DNA of all interested parties who participated in the "peace" process. A designated area on Earth would be set aside for the creation of this new species. The Earth-based Reptilians of Lemuria agreed to this under the condition that the Reptilian body be the foundation for this new being. This is why the original Bible states, "Let us make man in our own image." This is a plural statement because it was a group project. Many prototypes were developed over millennia. Under the supervision of the Hatona Council, races were created and then destroyed when it was not acceptable by all parties. This explains why ancestors of mankind appear and then suddenly disappear in layers of archaeological analysis. The African versions were created by beings from a nomadic, artificial planet known as Nibiru, or Marduk. These Reptilian-like beings travel in a manufactured world looping our solar system. The Sumerians called them Anunnaki. It is here, we would have to assume, the family of AN, with son’s Enki / Enlil (Lucifer / Michael - Adon / Yahweh) arrived from Sirius techno craft, with all the Nephilim genetic disasters we called THE RETURN OF ENKI. While people like Sitchin can add useful puzzle pieces like how their home atmosphere repair could gain the necessary gravity fractality using gold deposits, the Sumerian basically did not give him a clue as to the bigger galactic politic mess than triggered Enki’s (Abraham) genetic experiments. After repeatedly encountering the Enki/Enlil story in Australia (fish or dolphin god vs snake god -LEVITE), it was cool to listen to Creto Mutwa tell the Zulu KILIMANJARO means ENKI mountain! Such DNA programming invites tyranny and oppression. Soul-personalities attracted to such a planet have a victim mentality. Many advanced cultures call Earth a prison planet, and dump their criminals here as punishment. Once in a while, one of these soul-personalities reveal themselves, such as Richard Dahmer, Charles Manson, Richard Speck, and Vlad the Impaler (Count Dracula), to name a few. DUNE was a prison colony, like Australia. Earth fits the archetype. Like in Dune however, in Earth’s genetic cauldron of survival, the strongest DNA emerges: A ’VACCINE’ for the Orion wars? built by design? The current expression of the 2 brothers still tossing nuclear bombs then called East of Eden, today called the Middle East Conflict, may be a perfect healthy fractal of the Orion Wars, with the main warring galactic elements all nicely staged to work out a galactic conflict in a micro-cosm. This may be more however than a tempest in a teapot, because the galactic players appear to be willing to up the stakes with more intervention if their chess piece starts to lose. Enlil as Yahweh (the encoder in Bible Code) may not be willing to stand aside as his Israel under the hex Draco flag is destroyed by yet another nuclear blast. (predicted by Bible Code and Fatima & others) . As wingmakers so nicely pointed out - only the TRON (BST technology) with (ignited) DNA more time travel capable can defeat such predatory ET’s. These genes which time travel are precisely the jewel that always eludes Yahweh Enlil’s reptile (levite) family - they are stuck in THE CUBE, genetic software environment of the tetra (Hebrew alphabet) which can only make a golem. Israel was originally the genes of Enki when his Thoth Ptah line Akhanaton, took the gold from Egypt, assuming the Moses identity to start the Essenes. Trouble with the 12 tribes - genetic implosion symmetry - was when the oriental (queen Drac) Ashoka Ashkanazi, usurped the Sephartic, installing Enlil’s control in Israel. (also founding the Bank of England - described below as owning the US banking). The Reptilians ensured that the new Man would be forever attached to the Reptilian frequency because the foundational prototype was Reptilian. This meant that the new Man could easily be mentally controlled by them. Upon discovery of this information that the Reptilians wanted control of the new race, the Atlanteans began a severe electromagnetic bombardment of Lemuria. This bombardment caused the bulk of the continent to submerge into the ocean, now called the Pacific Ocean. The only parts left above the water are the Hawaiian Islands, the California coast west of the San Andreas fault, Australia, New Zealand, the South Pacific Islands, Japan, the Philippines, Taiwan, and the islands of southeast Asia. The Reptilian survivors went to Northern India, the Earths interior, the planet Venus, and parts of Central and South America. Inner Earth became the "homeland" for most of the surviving Reptilians of Lemuria. Here, they created a vast underground civilization. This started the legends of hell and demons living in fire under the Earth. They built tubes containing fast, subway-like vehicles that can travel to any point on the Earth within a few hours. They created the famed underworld cities of Akkadia, Agartha, Hyperborea, and Shamballa that are sought by explorers to this very day. These cities are built along the inside wall of the inner crust that lines the interior of the Earth. Remember, the hollow Earth is not a theory, but a scientific fact caused by the cooling and spinning of a planet as it is ejected from a star or sun. Shall we check to see if Meredith Lady Young, author of "AGARTHA" (book about the civilization of the inner earth) agrees? The primary entry points to the inner Earth are via the North Pole, where there is an opening of 1300 miles, and the South Pole, with an opening of 950 miles. These can be seen from space. That is why commercial aircraft are not allowed to fly over these areas; not because of magnetic disturbances, which is the "official" reason. Admiral Byrd reported on these openings in the 1920s until his information was concealed by the government. At the very centre, or nucleus, of inner Earth, there is a globe of energy left over from the creation of this planet that acts as an inner sun. It is the light from this object suspended by gravity and centrifugal force that causes the light of the aurora borealis. Numerous cave entrances to the inner Earth exist in the Rocky Mountains and Sierra Mountains in the western United States, as well as less numerous openings in the Ozarks and Appalachian Mountains. Entries also exist in the Alps, Himalayas, Andes, and the Caribbean. There are also numerous sub-oceanic entry points, particularly in the deep trenches of the Pacific Ocean, the Caribbean Sea, and the Atlantic submarine mountain ranges especially on or near the Azores, Canary Islands, and the Falklands. All of these areas are closely guarded by local governments and N.W.O. elite forces. Artificially created entrances exist under the new Denver airport, the Giza Plateau in Egypt, major Air Force complexes around the world, and many of the Temples in India and China. A major Chinese entry point is under the Shensi Pyramid that is out of bounds for everyone in Western China. Of course, with the Reptilians off the Earths surface, the Atlanteans were free to play with this new mankind and establish humans as the ruler of this planet. They established colonies all over the remaining portions of land. They invited the Sirians to come and play with them. They booted the Marduk beings off-world and took control of their slaves. They created new hybrids for sea and land, one of which became the Merfolk, a genetic blend of human and dolphin. The dolphin species was brought here from the Andromeda Galaxy to monitor all of these events. Whenever the Atlanteans detected underground Reptilian activity, they blasted the inner Earth with lasers and electromagnetic pulses to kill them. Unfortunately, this weakened the upper crust of the Earths top mantle riding over the trapped magma between the upper and lower crusts. After several millennia of these attacks, the Atlantean continent started to break up. Their civilization began to break up as a reflection of the physical deterioration of their continent. The Atlanteans became even more belligerent as fear and destruction overtook their mind-patterns. Black magicians and sorcerers took the place of scientists and religious leaders. Fortunately, the population foresaw the destruction that was coming. Many refugees relocated to what is now Egypt, Peru, the Appalachian Mountains and Western Europe, just before the continent collapsed into the upper crust of the Earth. This collapse caused the Earth to flip on its axis, creating the legend of the Flood written about in the Bible, and in other world cultures. This catastrophe was used as a window of opportunity by the groups that donated DNA to create mankind. They immediately began reorganizing the humans into new groups that became the basis for future nationalism. While all this was transpiring, the Reptilians saw an opportunity and seized it! 3. For further details of the flow of genetics an alien intervention in mankind, please refer to the Milky Way Galaxy chart on the book. American government is probably the main focus of the current reptilian shapeshifters. Your attention is drawn to the vertical slit eyeballs which shape shift in to many US military leaders - Norman Russbacher, Rupert Murdock, etc. Pictures: were at wiolawa.com We suggested new rules requiring all government decisions and voting must take place in 20% oxygen air, to kill the shapeshifters. Human form was necessary to maintain to avoid scaring the population, which was now not accustomed to the Reptilian form. The Sumerians became known as the sum-Aryans, or just, Aryans. They spread out across Asia into the steppes of Russia and into the Northern Indian subcontinent. In India they encountered the dark-skinned Dravidians, who were Reptilian remnants from Lemuria. The Dravidians were driven to the central and southern parts of India, while the Aryan hybrids took control of the north, and into the foothills of the Himalayas. The Aryan leaders, all Bluebloods, became the Sultans and Rajas of legend and history. Sumerians also created Babylonia. To back-track for just a bit, I had said in a previous chapter that the descendants of the Reptilian hybrid Sumerians went into Central Asia and the Middle East. They mostly established themselves in the Caucasus Mountains and became the Khazars. From here, they spread west toward Europe, seeding the national identities for the Vikings, the Franks, the Teutonic peoples, and the Russians. Keep in mind that when Atlantis sank, some of those refugees went to Western Europe and developed into the Celts. Some went to Greece and others to the Italian Peninsula. These peoples were here before the hybrids moved in. It was during the interim time period from the destruction of Atlantis until the Sumerian descendants moved in that other alien groups started to add their genetic mix to the pot and develop individual cultures based on their home worlds. The Sirians were also genetically creating the ancient Hebrews. The Jewish people are actually a combination of these genetically manipulated Hebrews and the Sumerians. These Jewish people were then released into the Palestinian territory. The name, Palestine, comes from the ancient people, the Philistines, who were actually Phoenicians. All of these mixed in the coastal plains of Palestine and created a new religion based on sacrifice and an avenging alien controller, that they called God, or Elohim. Similarly, when the Aryans mixed with the Dravidians in India, they created the Hindu religion, which is actually a recreation of the Reptilian seven-tier hierarchy. The caste system of India is a direct copy of the Reptilian division of function. At the same time that all of this was going on in western and central Asia, the Rigelians, were developing the remnants of Lemuria who escaped to the coast of eastern Asia. The Rigelians were a human civilization that was controlled, and eventually assimilated, by the Reptilians. The Rigelians assisted the inner Earth Reptilians in developing a hybrid that included Rigelian DNA. The Rigelian/Reptilian hybrids set up dynasties in what is now Japan and China that developed independently of their western cousins. In their mania for control, the Reptilians used the various races that donated DNA to the original human project. They fastidiously monitored these related sections of hybrids to determine which was best suited for overall control, and which for subservience. All the hybrids could be controlled through the Reptilian brain that hooked them into Reptilian mind-patterns, but some were more controllable than others. In Europe, the Bluebloods insidiously took control of the various tribes and groups, becoming their kings and royalty. They infiltrated the Arcturian experiment, called the Etruscans and started to create a new global empire through the Romans. These European Bluebloods then entirely eliminated the Antarian experiment in Greece, and instigated their plan for globalization through the Roman Empire. The Reptilians even offended the Sirians by infiltrating the Egyptian experiment and implementing their religion there. The Reptilian hybrids became like the endometriosis of the known world, slowly growing into all areas and creating control through the Blueblood system. While the Reptilians were the first colonists on Earth, they were not the only ones who interfered with human development on this planet. In all there are twelve other groups who donated DNA to the production of the experiment. Add the Reptilians to the twelve groups, resulting in human beings with a genetic mixture of 13 different strains. The result was a general free-for-all. While all these humanoid aliens were Lyraen/Reptilian descendants, each group was culturally and physically manipulated by different groups. This is similar to a lab professor who leaves the door open while he is gone, and all his assistants add their own genetics to the experiment. The Tau Ceti aliens centered their attention on the eastern European area, from what is now Serbia to the slopes of the Ural Mountains. From here, they influenced the Slavic and Russian peoples. The geographic conditions resembled that in the Tau Ceti star system, and its colony Epsilon Eridanus. The Tau Ceti added their DNA to the human prototypes that were already established there, creating what is now known as the Slavic peoples. The results were a race of humans who were stocky, barrel-chested, and averaging 5’6’’ to 5’9’’ in height, with a dense bone structure and dark eyes. They were aggressive, and preferred a cold climate. These Tau Ceti/humans were virulently against the grey alien race and the Reptilians, because their worlds had been attacked, and their children stolen and killed by both races. The Tau Cetians vowed to follow the grey race and destroy them. In the 1950s, the Soviet Union signed an agreement with the Tau Cetians to use bases in Siberia and under the Ural Mountains. For this reason, the city of Sverdlovsk, named after my great-uncle, the first president of the Soviet Union, was closed to outsiders (click image left). Many experiments involving radiation on the public were performed here from 1958 through the 1980s. A United States spy plane was shot down over Sverdlovsk in the early 1960s when the United States was trying to learn about the secret activities taking place there. In central Europe, the German tribes were genetically manipulated by beings from Aldebaran. These people are very intelligent and scientifically-oriented. They are generally blonde-haired and blue-eyed, with a minority of dark-haired, light-brown to hazel-eyed people. They are militaristic, and prefer to keep to themselves. For almost 2,000 years, the Aldebarans have been energetically connecting to the Germanic peoples, telepathically sending information to them and promoting a national sentiment. Many humans of the Aldebaran frequency have mixed with the Tau Ceti descendants in the Slavic area, particularly in Poland and Russia. Hitler knew this. That is why he was so adamant about invading those countries and incorporating them into his empire. Hitler was only half Germanic. His father was a wealthy Jewish businessman in Austria. His mother worked at the home as a maid. She had an affair with the master of the house, and when the wife found out about it, had the maid thrown out. The Jewish businessman did nothing to help Hitler’s mother. For this reason, Hitler hated the Jews and sought to destroy his own genetic lineage, basically because he hated himself. He was also deeply mind-controlled. The Aldebarans also genetically infused the Vikings. These Nordic people inherited the aggressive and militaristic tendencies that are also seen in the Germans. The Vikings plundered and raped across Europe for centuries, but did not have the technological ability to stay in power. An accidental manipulation of genetics occurred on the Italian peninsula 3000 years ago. A ship from the Arcturus star system crashed landed on Etruscan territory. These humans were actually extremely spiritually-minded, and instead of trying to get back home, stayed and blended into the humans of that part of Earth. Their descendants became the Romans who were then infiltrated and mixed with the Central Asian hybrids. Beings from the Antarian star system were behind the genetic manipulation of ancient Greece. These people were a society predominantly based upon homosexuality. Females were used for breeding only. In fact, there were Antarian observers at the Montauk Project who were interested in the programming aspects of sexuality as they related to the Wilhelm Reich methods. The Antarians are dark, often with olive skin, dark eyes, and short, thin bodies. They have a fabulous musculature due to the density of their home-world, and are known for their body-building goals. The Greek-Antarians colonized Spain and Portugal. 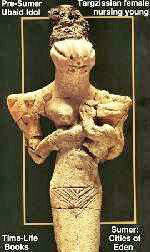 Their descendants further mixed with the Romans, and Arabs who are predominantly Sumerian/Reptilian. These then colonized Central and South America, mixing their genetics with the native Indians who were of Atlantean-Procyon descent. The Procyon star system does not have much technology. The Procyons were brought to this planet after the fall of Atlantis to boost the survival rate of the refugees. They became the Maya, Aztec, and Inca. They were given ancient Lemurian and Atlantean outposts in the Andes and Sierras of Mexico. They tried unsuccessfully to recreate these cultures, including emulating the building of the pyramids, performing medical procedures, and finally, sacrificing to the Reptilian gods. This is why their legends speak of blond men returning in chariots from space to take them away. The Anasazi Indians of the American southwest were also brought from Procyon. It was the Sirians who so generously provided transportation. The Sirians even attempted to bring the Hebrews to the American west. Ancient Hebrew coins were found in New Mexico and other parts of North and South America. Over the millennia and recent centuries, movements of nations, colonizations, war, and famines, have thrown the Earths population into a giant melting pot. Strands of genetics have continuously mixed with one another, especially in North America, Europe, Australia, the Caribbean, and South America. The result is that there are few pure races left, and the racial and cultural unity makes it easier for group control. While all of this was going on in Europe and the Middle East, the Chinese Empire was expanding over East Asia, and the Dravidian-Reptilian culture in India was being replaced by the Aryan (Ari- and Sum-Arian) hordes from Central Asia. In South America, the Inca Empire was flourishing as it was mixed with the genetics of the Procyon star system. The same mixture was happening in North and Central America creating the Toltecs, Mayans, and Aztecs. All of these cultures, used blood-ritual and human sacrifice. This indicates that the Procyonians were themselves conquered by the Reptilians and did their bidding, even though they were humanoid. All of the Central and South American cultures used snakes and Reptilians as symbols. These people have a unique blend of Lemurian/Draco and Atlantean/Human genetics mixed with the Procyonian DNA. When the Hatona Council convened to determine the development of life on Earth, they pondered two questions. First, if the Earth beings were left to develop on their own, how would they know their true origins, and second, if there was no interference, how could they be prodded in the correct direction. One E.T. group that was primarily non-physical decided to leave a repository of knowledge for those who evolved enough to understand it. These muscular beings were tall with golden-bronze skin, golden hair, and violet eyes. On an etheric level, this E.T. group created an object that contained within it the sum total of knowledge of the Mind of God as they knew it. They also programmed this object with the history of the universe and all the technology that would ever be necessary. For the object this group chose the shape of a female human skull without any racial features. The skull represented all humanoids, symbolizing brotherhood and harmony. The female was chosen because it was to be placed in physical reality as a symbol of ego being overcome. Crystal was chosen because it represents the highest vibration possible in physical reality - purity, clarity, focusing, and magnification. The movable jaw piece (click image right) symbolized the fact that it was a communication device. The E.T. group left the Crystal Skull with the first Lyraen/ Atlantean civilization where it was placed in a temple pyramid to be energized by the Lyraen/Atlanteans over many aeons of time. When the Sirians infiltrated the second-generation Lyraen/Atlantean civilization, they negotiated with the Atlans to study the Crystal Skull. Over time, they created an exact duplicate that they brought back to Sirius A. Other alien groups made inferior copies of it for use with their own human creations. By the time the third-generation Lyraen/Atlanteans were well established, the true purpose of the Crystal Skull was almost entirely forgotten. Those in power tried to use it for negative purposes, not realizing that this magnified and reflected back all their evil deeds and intentions. In addition, the Crystal Skull was created in such a way that whatever is thought in its presence reflects back, becoming a part of the thinker’s experiences. The Crystal Skull teaches that the physical universe mirrors thoughts. When Atlantis sank, high priests fleeing the continent brought it to Central America to where the Procyonians brought the Maya. Here, it was used as an object of worship and reverence until the Maya were removed from the Earth. Eventually, the Crystal Skull remained buried in ruins until its discovery in the early part of the 20th Century, when the Crystal Skull allowed itself to be discovered. 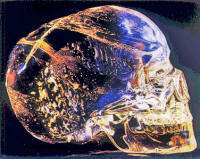 The Crystal Skull operates through the trinity of communication color, tone, and archetype. When any combination of these three is beamed or thought of in the presence of the Crystal Skull, it opens a program that is coded to a particular frequency resonance. An infinite number of combinations can be used, and any one will unlock a program in the Crystal Skull to teach mankind. The left-brain represents language, and the right-brain represents pure thought. The pineal gland of communication balances and translates the left- and right- brains with the use of archetypes. Archetypes can be geometric shapes, letters, numbers, Ancient Hebrew symbols, pictograms, or any combination of these. Colors are also part of the triad with a language all their own. The left-brain is dark, the right-brain is light, and once again, the pineal gland balances and translates this through colors. Tones also represent the trinity of sound, balancing music and silence. In the same way, the Crystal Skull balances the Mind of God and physical reality. At times, the Crystal Skull becomes non-physical. Because it was created without a body, this symbolizes the needlessness of the physical body. The Crystal Skull is a bridge between all levels of reality. Anyone who knows the sequences of the trinity of communication becomes all-powerful and omniscient.